Fall is here! It may just be our favorite time of year! Cool crisp air, leaves changing colors, the smell of apples, cinnamon and pumpkins galore! Fall Colors and Flavors are here! To celebrate this year's season we'll be rolling out drink specials throughout the Holidays! So come on in and try our Newest Drink Special: Apple Pie Mimosas! Before Pumpkin Spice Season was synonymous with fall, Apples were the unofficial flavor of the season! Apples deserve to be remembered, whether it's warming up your home with a fresh apple pie or making a cocktail that encompasses the spirit of fall, apples merit a place on the table. This year we're honoring apples in cocktail form with our Newest Drink Special: Apple Pie Mimosas! Grab your friends and come create with us this season! 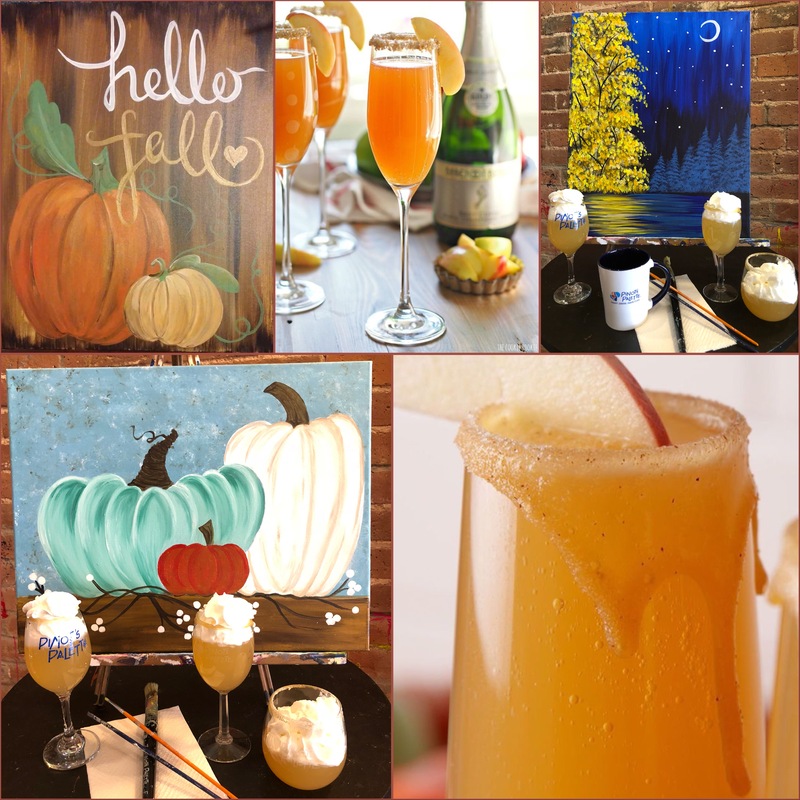 Painting in Fall Colors and Drinking Fall Flavors! While we would love a real apple pie, this recipe brings those flavors together in drink form. This is currently our featured drink special here at Pinot's Palette Westminster, and we have a feeling you're going to LOVE it! 4. Serve in glass with decorated rim. We encourage all guests attending our events at Pinot's Palette Westminster to bring anything they'd like to snack on during the class. For your convenience, we provide paper plates, napkins & plastic utensils. This month our calendars are exploding with the beautiful hues of Fall! Invite your friends or book a date night and experience an unforgettable evening of Painting, Drinking, and Having FUN! Enjoy 10% OFF each seat! When you use discount code: WEST10%. We look forward to painting with you soon! Cheers! Share View Calendar of Events!